GINEBRA STAR GUARD LA TENORIO HAS A NEW CALLING, CHALLENGE | Snow Badua - PBA Latest Updates! Ginebra star guard LA Tenorio spreads the gospel of basketball to kids in the provinces via Globe's TM Basketball Para Sa Bayan program. It seems Barangay Ginebra point guard LA Tenorio has found a new purpose for the country despite being cut from the final line-up of Gilas Pilipinas for the 2016 FIBA Olympic Qualifying Tournament. Globe Telecom officially announced that Tenorio will lead its nationwide basketball youth program for the underprivileged called TM Basketball Para Sa Bayan. The TM Basketball Para Sa Bayan program consists of free basketball clinics and a 3-on-3 tournament nationwide for boys and girls age 9-14 from mid-July to mid-August this year to determine the team that will participate in the NBA 3X 2016 in Manila next month. After its pilot run in Cavite last May, Globe will hold TM Basketball Para Sa Bayan in four more provinces: Bulacan, Isabela, Cebu and Davao. 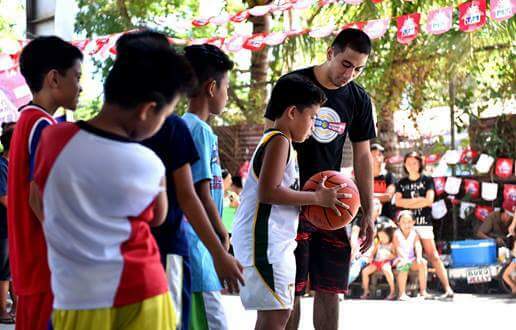 Globe Director for Citizenship Fernando Esguerra said that it is rare for a local basketball superstar like Tenorio to show an innate passion for teaching the youth. “We witnessed LA’s big heart for coaching when we invited him to conduct the first TM Basketball Para Sa Bayan free basketball clinic in Cavite last May. With his help in this program, we hope to further promote grassroots sports development in the country, hone the basketball skills of underprivileged youth as well as impart to them the value of sportsmanship,” Esguerra said. Tenorio said that he is very thankful for the opportunity to teach basketball to underprivileged children with Globe. “I guess everything happens for a reason. I am really grateful for being given an opportunity by Globe to impart my knowledge and skills to the future basketball stars that may one day represent the flag in international competition,” Tenorio said. TM Basketball Para Sa Bayan is a component of larger Globe sports development program called ´TM Sports Para Sa Bayan´. Given the popularity of basketball and football among Filipinos, Globe uses these sports as the perfect platform to promote a healthy lifestyle, build character, and create opportunities for academic advancement for the underprivileged Filipino youth -- instilling in them not only the importance of having great skills but also of possessing good values and good education.